This ride has been in the pipeline for the past two weeks. The date was chosen based on the availability of a friend who, in the end, couldn’t make it. But it turned out to be the perfect day for it. The aim was to do another 250k ride, but this time made up of one ride as opposed to several rides joined together like last time. I chose another route in Essex using the Gravesend-Tilbury ferry like I had before. 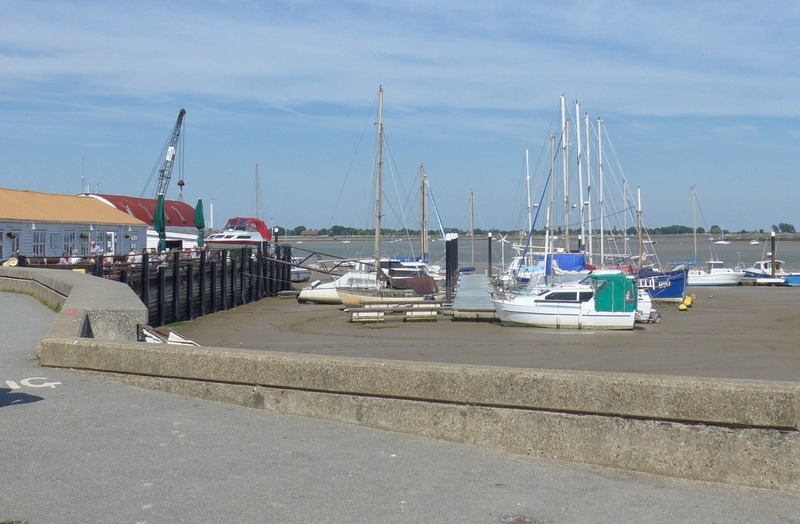 About a week before the ride I was speaking to a friend who said he had recently bought a boat and it was moored at Heybridge Basin. When I checked the route I had planned I discovered that it went straight through Heybridge. Amazing coincidence! So I factored in a visit to him and his boat as part of the ‘itinery’ for the day. This told me what sort of average speeds I would need to do in order to achieve certain times over the various legs. The ferry ran every half an hour except for an hour break in the morning at exactly the time I would have chosen (ie 9:30). So I was forced to aim for the 9:00 ferry. I prepared my bike and got all other stuff ready the night before. I also printed out the above table and the ferry timetable to take with me. I would leave at 06:50 to allow me two hours at 14 mph to get to the 9 o’clock ferry with ten minutes to spare. Another friend had emailed the night before saying he would meet me at the ferry and join me for the ride. I got up at 06:10 and it was a glorious sunny day. I had a bowl of porridge for breakfast and got myself ready. Then I noticed that a slight rattle coming from my Colnago was because the wheel bearings were extremely loose. Damn! I had to use the Giant Defy, but that only had one bottle cage, so I took one off the Colnago and fitted it to the Defy. Needless to say I was now running late. 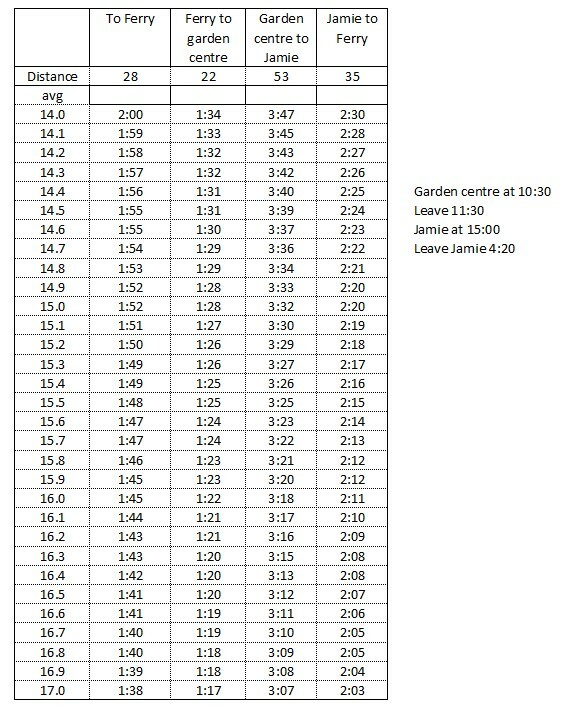 Instead of leaving at 06:50 I left at 07:00, which meant I would now have to average 15 mph to the ferry (see chart above! ), and it was quite a hilly start to the ride! The temperature was milder than I had been expecting at 12°C so I just wore arm warmers, no rain jacket. Two miles into the journey, I was coming over Teston Bridge and was pleased to see that the level crossing was open, but as I approached, the lights started flashing. “No way!” I thought. I pressed on. The lights changed to steady red and the barrier started to come down by the time I had reached it. I cycled through just in the nick of time. Not quite as dramatic as Paris-Roubaix 2015, I didn’t even have to duck! Waiting there would have caused a serious delay to my now tight schedule. Over the first twelve hilly miles I managed to keep just above the target average of 15 mph, but I still had the steep climb of Exedown to come. This was a new one on me and I didn’t know what to expect. I was wondering where it started when I realised I was already on it. Then I reached the hairpin and thought that’s OK, this is probably the worst bit. But it’s after the hairpin where it ramps up, although only to about 13.5%. It was a slog but I managed to stay in the saddle for the whole climb. By now my average had dropped to 14, but I knew I had the long descent of Knatt’s Valley to come. On a sunny summer morning Knatt’s Valley is a really beautiful piece of road and I flew along it at 20 mph, feeling great. I rode through Horton Kirby and would have taken some photos of the viaduct had I not been running late. 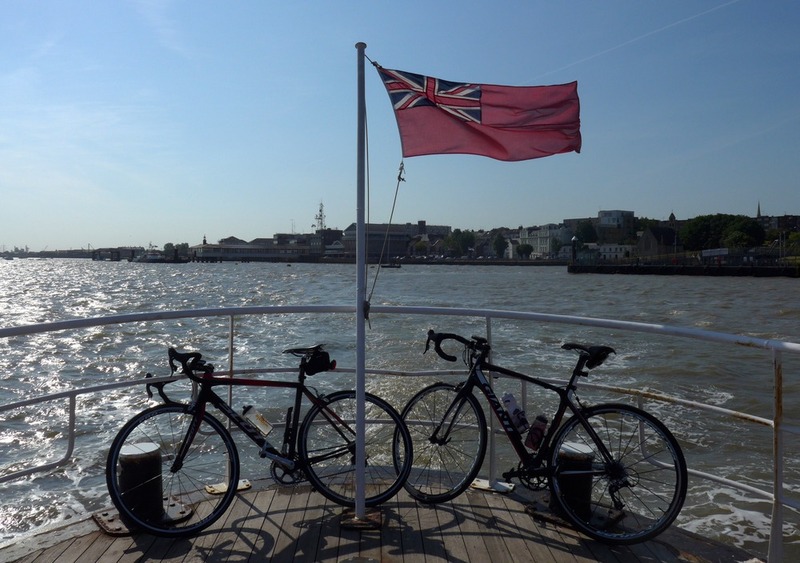 My speed was back on schedule now as I rode though South Darenth, Green Street Green and on to Gravesend, where the morning rush hour traffic was heavy, but I got through it without too much delay to reach the ferry by 08:50, exactly as predicted. My friend Alan was waiting there, so I wouldn’t be taking on this epic ride alone! We boarded the ferry. Four minutes later we disembarked in Essex. Shortly into the journey we tackled a 1.2-mile section of gravelly unmade road. Alan wasn’t impressed and nor was I. I had taken this short-cut on my previous ride here, but I don’t think I will again! Six miles later we found the road ahead closed, blocked off by a metal fence right across the road. Another couple of cyclists were there and they said that there was a sink-hole but we should be able to skirt round it, so all four of us lifted our bikes round the fence and proceeded up the road, but only as far as a workman, who told us that the the sink-hole had got bigger and we definitely couldn’t get past it. Damn! We rode back to the main road and headed north hoping we could rejoin our route further up the road. Eventually we did find the route and our GPSs were happy that we were on the route, but there was something wrong. With the sun in our eyes we wondered why we were heading south – that couldn’t be right, so for the umpteenth time we stopped and consulted our gps and phones. We concluded that we were on course but going the wrong way! So we turned around and carried on. The sink-hole had cost us an extra five miles and lots of stopping to wonder where the hell we were! We arrived at the garden centre at about 11, slightly behind schedule but not too bad. That’s when I realised that I hadn’t packed my print-out of the spreadsheet. Ah! How will we survive without it? After an egg on toast and a cup of coffee, we topped up our bidons and were on our way. I had also taken the opportunity to remove my arm warmers. 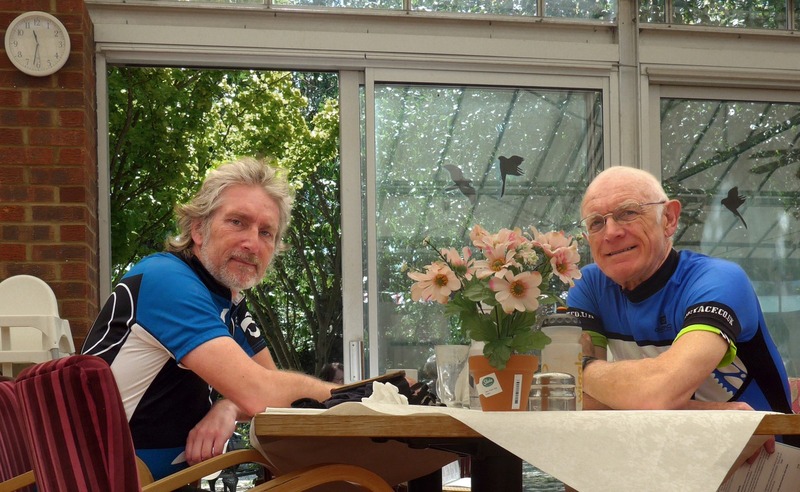 The next ‘mad-dogs-and-Englishmen’ section entailed fifty miles of riding with the hot June sun virtually overhead, including about twenty miles into the easterly breeze. Even though it was a beautiful sunny day the temperature only reached about 21°C, which was ideal really. Only a couple of times did I feel too hot. I started getting hungry during this bit and as we rode through Braintree I became fixated with the idea of a Mars bar. I promised myself I’d stop at the next newsagents I saw, which I did. It went down nicely and gave me a much-needed energy boost. There were lots of straight, fast roads on this section and the wind didn’t really hamper us as much as I had been expecting. 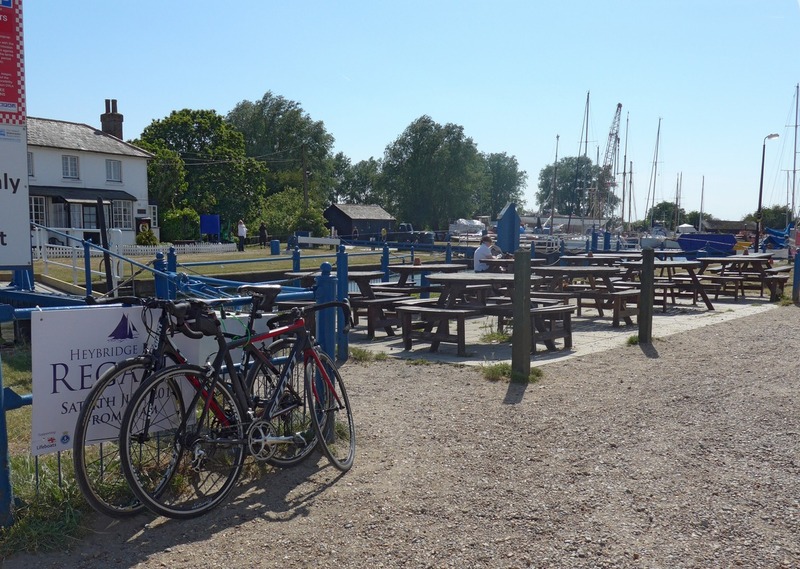 We reached Heybridge Basin in just over three hours. After a bit of a delay finding Jamie’s boat, I had a quick look round it then we three headed for the café for some more grub. This time I had a delicious toasted cheese and onion sandwich and a coffee. We had completed 100 miles with ‘only’ 60 to go! We left Heybridge at 16:30, 10 minutes later than planned. We had 35 miles to the ferry. Shortly into that section I did some calculations in my head and realised that I must have got something wrong before. There’s no way we could make the 18:40 ferry unless we averaged over 17 mph. Luckily the wind helped us on this leg. We put a big effort in and made good progress. Because of the sink-hole detour earlier I had no way of knowing exactly how far we had to go to reach Tilbury. Some of this section was spent riding through built-up areas, including the busy dual-carriageways and roundabouts that we had to negotiate in the Basildon rush-hour! Still we pushed, with regular time-checks. “What’s the time now Al?”. It was going to be tight. Just as we were nearing Tilbury, we were caught at a level crossing in Linford. Two miles later we were stopped at another crossing. Damn! But it was worse because the gates stayed closed and waited for another train. This gave us some time to calculate. We had twenty minutes before the next ferry. If it was less than six miles away, then we could just get there if we averaged 18 mph. At last the gates went up and we were off again, pushing hard. We averaged 20, and there turned out to be only three miles left. As we sped into the docks we saw the ferry approaching the quay. Yay! We had made it. We had averaged 18 mph from Heybridge, but only 14.5 through the chaos of Basildon. We had a well-earned sit down on the ferry and scoffed an energy bar. 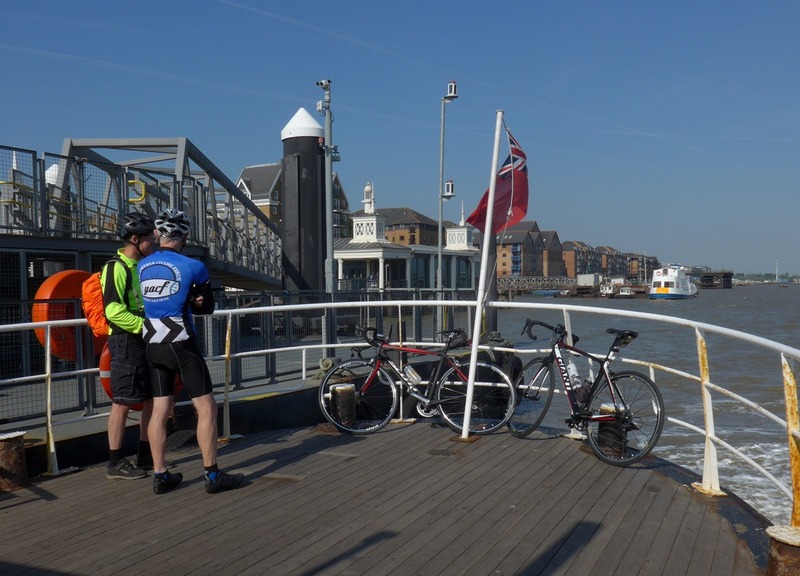 I had already decided earlier in the day that I didn’t fancy my relatively hilly route back from Gravesend to my house, so I decided to stay with Al on his flatter route through Strood and across the Medway Bridge. At one point, at about the 154-mile mark, I commented to Al “I think I could just keep riding forever”. It was about eight o’clock. We were on a gently undulating road, following the Medway as it wound its way towards Aylesford. The air had cooled and felt refreshing. The sun was still shining and the wind had disappeared. To our right was a beautiful view of the Medway Valley, now just beginning to get misty as the day started to wind down. I had no pain; no back ache; no saddle discomfort; even my knee felt OK. If that road had continued forever and I had enough juice I’m sure I could have just kept on going for another 50 miles easily. At Aylesford we went our separate ways. I decided on a fairly easy route with just a couple of steady climbs back to my house. I got in feeling pretty OK. I drank a pint of milk and had three cups of tea, still thirsty. Note: Sorry about this post being timings-heavy, but that shows what was going on in my mind for most of the day. I felt like John Cleese in Clockwise! Epic ride Vince, wish I had that kind of stamina! Cheers Ben. You have to build up gradually, then pick a flat route, and make sure you properly stop to eat every so often. Indeed. I’ve done 100+ before but 250k?! Maybe by the end of the year. Great blog by the way – a constant source of route ideas! Brilliant blog. As the fellow traveller on this trip (and also the audax and night rides) could I add a few comments? There were many ” how’s the time going Al” requests, in fact almost as many as my ” are we nearly there yet, Vince?” requests from me. Vince is a great ride companion in that he plans the stops well and insists on taking a break. I’m more inclined to grab some food and drink and get back on, leading to earlier fatigue. Both of us have ( for this trip at least) well sorted positions and comfortable saddles and shoes which enabled us to endure – no enjoy! – a 13 hour jaunt. The route was brilliant except for the 5 mile bit through Basildon. This was fairly horrific, competing with desperate Essex home bound commuters on busy dual carriageways and roundabouts. Thanks Al. I’m sure we have many more miles of suffering (I mean enjoyment!) ahead of us!